In vivo molecular imaging includes a range of techniques that are aimed at macroscopically and in vivo visualising molecular events at a cellular level. Small animal positron emission tomography (SA-PET), small animal single-photon emission tomography (SA-SPECT), small animal magnetic resonance imaging and optical imaging are the most interesting and are based on the use of targeted probes binding to specific molecules (receptors or ligands) or those that are included in specific metabolic processes. Those techniques are very expensive but meet a wider and wider employment since they have the advantage of analysing the same subject over time. 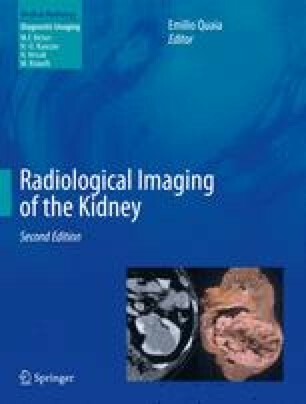 The application of those preclinical imaging techniques for the basic study of kidney diseases is still an emerging field. This chapter will approach the use of preclinical molecular imaging and tumoral antigen targeting in kidney diseases.